Michigan History Day (or National History Day in Michigan) is an educational competition designed to encourage students to explore historical subjects, while offering a fascinating opportunity to learn through hands-on study. Projects may be from international, national, state or local history. Its methodology includes extensive primary and secondary source research into a topic of the student's choice as related to the annual theme. This learning experience includes history/social studies, English and language arts. The competition is open to all students Grades 4-12. Students may participate in one of the following categories as an individual or group: exhibits, documentaries, performances or websites. Research papers may also be done on an individual basis. Teachers: As part of our support of students and teachers for Michigan History Day, the MHD Education team at the Historical Museum of Bay County provides free classroom visits to help your students on their MHD journey. Beginning in October teachers may begin to schedule classroom visits. The District event is usually held in March at the Delta College Planetarium and Learning Center in downtown Bay City. Winning students from the district event will then advance to a State competition held in April. The District Competition (March 9, 2019) and State Competition (April 27, 2019) will both be held at: Bay City Central High School, 1624 Columbus Avenue, Bay City. Use the links below to find more information on Michigan History Day, National History Day and a study showing the positive impacts of these programs on students who participate. The Bay County Historical Society is proud to be the District 5 coordinating agency, working with Historical Society of Michigan to bring Michigan History Day to local students. 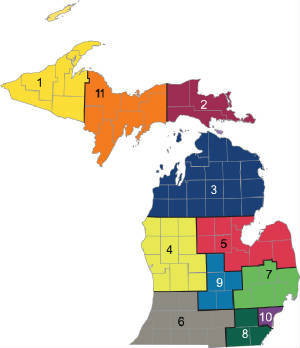 District 5 consists of ten counties: Bay, Saginaw, Arenac, Gladwin, Clare, Isabella, Midland, Tuscola, Sanilac and Huron.